On Friday, 12 August 2005, we awoke over Europe after sleeping about 4 hours. Breakfast was served. We enjoyed seeing snow-topped Alps. Our plane landed in Zurich, Switzerland, about 10:30 a.m.
About 1 p.m. our Swiss Air flight departed for Prague. A small sandwich was served for lunch during the 1 1/2 hour trip. We easily passed through Immigration and Customs at the Prague airport. We were pleased that our two bags arrived with us. We had not seen them since we checked in at Fort Smith on the previous day. It was nice to see our names as we exited the airport on a sign held by the driver sent by the tour company. He spoke English well and answered all of our questions during the 30-minute ride to the Hotel Ambassador at Wenceslas Square. Wenceslas was the first prince of Bohemia. He was murdered on the orders of his brother in 929 A.D. Wenceslas later was declared St. Wenceslas. It was he about whom was written many centuries later the English Christmas carol about "good King Wenceslas." He was never a king. 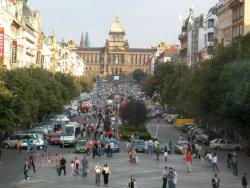 And Wenceslas Square is not really a square, but more of a long boulevard, 65 yards wide and 825 yards long. We were met, on arrival at our hotel, by Peter Koua'csi, our Hungarian tour leader. After we got settled into our room, we spent a couple hours shopping near the hotel. At 7:20 p.m. we met 9 other members of our tour group: Jim & Susan Jennings and daughters Alexandra & Caroline, Marc & Nora Sales, Jerry Yale & wife Kathy Elvin, and Claire Walsh. We walked together to a Czech restaurant, a few blocks from our hotel. (The sun was up till about 8:30.) The food was good, but the advertised Czech "folklore" was far less entertaining than we all expected. The live instrumental music was not all Czech and the dancing consisted of only two people. Michael and Jeannie each took Lunesta 3mg on Friday night to insure a good night's sleep to ward off jet lag. We needed no further sleeping pills in Europe and had no jet lag problems whatsoever.